Northampton Town's goalkeeping coach Billy Turley remains confident the club will stay in the Football League. The Brackley Town keeper, who played for the Cobblers in the 1990s, was brought in by his former boss at Oxford, Chris Wilder. Turley told BBC Radio Northampton: "I was adamant he'd keep them up when he came in. "He's a really good manager and the training is fantastic - it's lively and there's no doom or gloom." The Cobblers remain in the bottom two of League Two with two matches remaining, after their 1-0 defeat by Portsmouth on Easter Monday. I love training goalkeepers. I'm still playing, so I can relate to them. 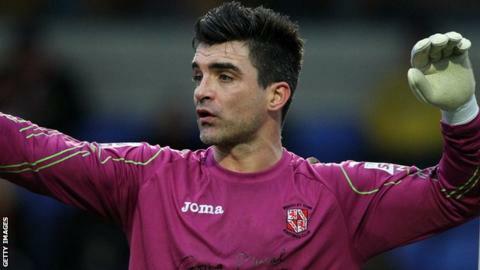 Turley is pleased with the form of goalkeeper Matt Duke, though, after four clean sheets from 12 matches. "Matt Duke is experienced, having played in the Premier League, but this might be the first season he's played every game," said Turley, whose Brackley side beat Gillingham in the FA Cup this season. "Dean Snedker has really impressed me in training and both of them have got a great work ethic. "I'm not there to tell Duke how to make saves, I'm there to make goalkeepers feel good in the week so they go into the game on a Saturday confident." Turley hopes to continue in the role at Northampton, but has ruled out a future move into management. "This came up and I love training goalkeepers. I'm still playing, so I can relate to them. "I had the best mentor in the world, Alan Hodgkinson. He's god of goalkeeping coaches and if I hadn't taken anything from him, I'd be a very silly boy. "I want to play another year and play as long as I can. I couldn't be a manager - I don't think I've got the temperament for it."